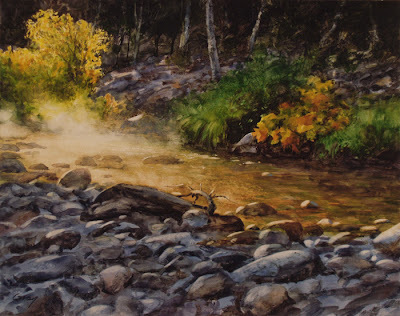 Watercolor on paper, 10 3/4" x 13 1/2"
$500 plus $10 shipping in U.S.
A larger painting for today--mist rising off the water in the early morning sun. This watercolor is painted on heavyweight plate bristol paper. The paper is hard and very smooth, which keeps the paint floating on the surface. Washes retain beautiful clarity, but are easily lifted by successive brushstrokes. It's always a dance, partly in and partly out of control, which is what I love about it. Maybe what it really teaches me is that "control" is just an illusion, in life as well as painting. Gosh I've never worked with bristol paper before, this is lovely Don! Since the onset of the season I've been mesmerized by the steam the lingers over the waters for a couple hours but I never did get the momentum to capture it. So this is a treat to see! Well looks like the season has been very good to you -good for you! Yes it's really got some magic and mystery to it Don, both the subject and the materials you have used. This is another very nice painting! Warm and cold. Very nice! Try the bristol sometime, Erika, you might like it. I use Strathmore plate--must be about 250-300 lb. I've never worked on Yupo, the plastic surface, but I think it's probably similar. Thanks, Sheila--I'm happy to hear that's the feeling you get. Thanks, Suzanne. Really enjoying your recent paintings. WOW Don! This is a knockout of a painting..
Hi Gerald, welcome to the blog and thanks for the kind words. You do fine work yourself.